Pull Rite SuperGlide is the ONLY true solution of safe 5th wheel towing with short bed trucks - protecting passengers, trucks and trailers. Pull Rite SuperGlide fifth wheel hitches automatically moves the trailer away from the cab while making turns - allowing up to 90Âº turning without stopping, slowing down, or even thinking about the space between the truck and trailer - and then automatically returns the hitch and trailer to the safe towing position over the truck axle when the turn is completed - going forward or backing up. All Pull Rite SuperGlide hitches feature fully articulating dual pivot head, and Super 5th's unique rotary latch that locks automatically when hooking up to the trailer. 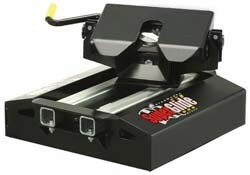 The gear driven latch design minimizes "bump" while towing by allowing only .030" clearance between king pin and latch. The Pull Rite18K SuperGlide moves up to 14" while making a turn - 50% farther than manually adjusted "slider" designs - and works AUTOMATICALLY, while you drive and make short turns. Available with a choice of mounting styles - fixed base rails with universal mounting brackets for lower cost, or totally removable SuperRails with stronger, more stable custom designed mounting brackets for specific vehicles. Requires either QuickConnect Capture Plate or Universal Capture Plate for installation - see us for pricing and part numbers.